CO2 release by mild heating of the BIG-bicarbonate solid. The released CO2 gas is trapped in the orange balloon, while the released water vapors are trapped by condensation in the ice-cooled U-shaped tube. Credit: Neil J. Williams and Erick Holguin. Bicarbonate precipitate resulting from CO2 bubbling through an aqueous solution of the bis-iminoguanidine (BIG) sorbent. Photo credit: Neil J. Williams. February 5, 2019 – Scientists at the Department of Energy’s Oak Ridge National Laboratory (ORNL) have developed a process that could remove CO2 from coal-burning power plant emissions in a way that is similar to how soda lime works in scuba diving rebreathers. Their research, published January 31 in the journal Chem, offers an alternative but simpler strategy for carbon capture and requires 24 percent less energy than industrial benchmark solutions. Soda lime is a solid off-white mixture of calcium and sodium hydroxides used in scuba rebreathers, submarines, anesthesia, and other closed breathing environments to prevent the poisonous accumulation of CO2 gas. The mixture acts as a sorbent (a substance that collects other molecules), turning into calcium carbonate (limestone) as it amasses CO2. The ORNL team’s CO2 scrubber works in essentially the same way to treat the CO2-rich flue gas like that released by coal-burning power plants—although advancing carbon-capture technology was not always their objective. “We initially stumbled into this research by accident,” says senior author Radu Custelcean, a research scientist at ORNL. Custelcean and his team recently “rediscovered” a class of organic compounds called bis-iminoguanidines (BIGs), which were first reported by German scientists at the turn of the 20th century and recently noted for their ability to selectively bind anions (negatively charged ions). 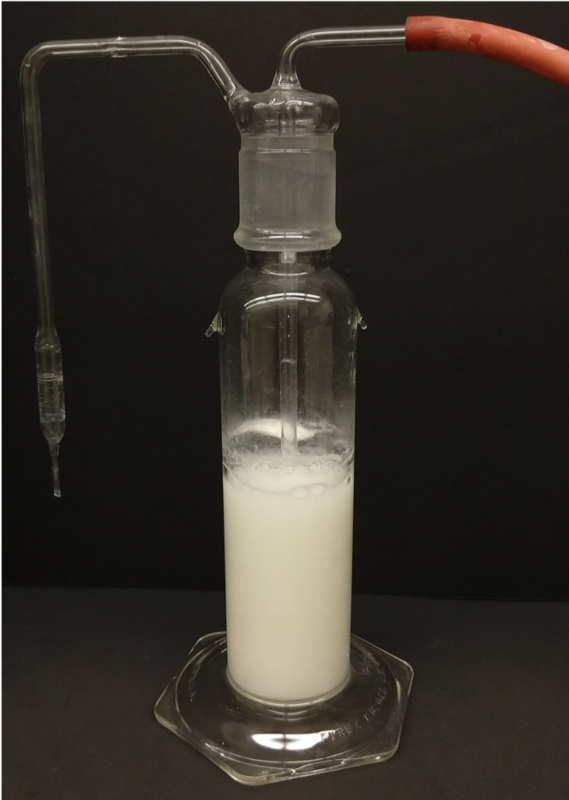 The team members realized that the compounds’ ability to bind and separate anions could be applied to bicarbonate anions, leading them to develop a CO2-separation cycle using an aqueous BIG solution. With their carbon-capture method, flue gas is bubbled through the solution, causing CO2 molecules to stick to the BIG sorbent and crystallize into a sort of organic limestone. This solid can then be filtered out of the solution and heated at 120°C to release the CO2 so it can be sent to permanent storage. The solid sorbent can then be dissolved in water and reused in the process indefinitely. State-of-the-art carbon-capture technologies come with major flaws. Many use liquid sorbents, which evaporate or decompose over time and require that more than 60 percent of regeneration energy be spent on heating the sorbent. Because their approach involves capturing CO2 as a crystallized bicarbonate salt and releasing it from the solid state instead of heating a liquid sorbent, the ORNL team’s technology circumvents these issues. Their twist on carbon capture requires 24 percent less energy than industrial benchmark sorbents. Plus, the team observed almost no sorbent loss after ten consecutive cycles. Although it is still in the early stages, Custelcean and his team believe the process will eventually be scalable. However, the technique does have a road bump to contend with—its relatively low CO2 capacity and absorption rate, which come from the limited solubility of the BIG sorbent in water. UT-Battelle manages ORNL for DOE’s Office of Science. The single largest supporter of basic research in the physical sciences in the United States, the Office of Science is working to address some of the most pressing challenges of our time. For more information, please visit www.science.energy.gov. —from a press release of CellPress.